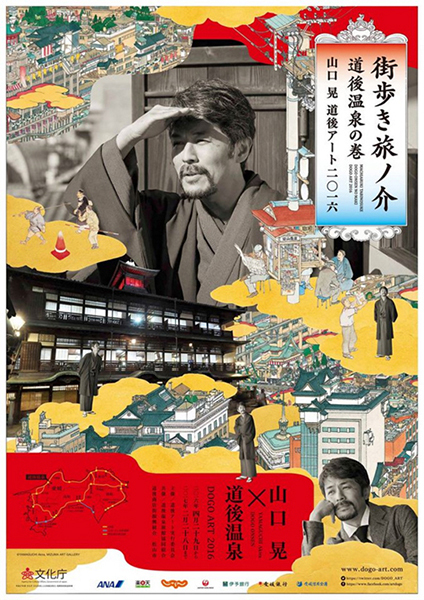 YAMAGUCHI Akira is participating as the main artist in ” ‘City Strollers in Dogo Onsen’: YAMAGUCHI Akira x DOGO ART 2016″ held at Dogo Onsen and the surrounding areas in Matsuyama city, Ehime prefecture, opening on Friday 29th April (a national holiday). 2016 marks the third year of the DOGO ART festival, and is also 100 years since the death of the literary master Natsume Soseki, and 110 years since the first publication of his novel ‘Botchan’. Just as Soseki came from elsewhere to live briefly in Matsuyama, which he made the setting for the ironic and humorous ‘Botchan’, so too Yamaguchi has depicted Dogo from the perspective of an “outsider”. *reservation is not needed. ?Reception opens from 12:30.